We did not see very many this year. We have not seen many either, the last few years. The condition of our environment is, unfortunately, taking its toll on them. “camera manipulator” I like that! Confucius says: To manipulate cameras is far superior than trying to manipulate men. The aloneness that he cherishes – your words honor the privacy briefly interrupted. Great photo – “hanging around” indeed! You have a good eye (and a little luck?) to spot this. Luck had little to do with it. 🙂 I had to look a lot for PMs! They are far more scare these days, due, unfortunately, to our deteriorating environment. I’m so great-full they’re not bigger, imagine. Great shot. Great shot of a fascinating insect. Yes, they rank high on the creepy scale! On a recent walk on our road, my oldest daughter found a praying mantis sitting on the road. Concerned for its safety, she picked it up and placed it gently on her shoulder. The mantis remained there for the entire walk (about one half hour). When we got home she placed it in our garden. There has not been as many, i think, because of the deterioratating environment, unfortunately. Lovely poem and photo. Looks like the ones I used to see around here, but haven’t for a while now. Not so many any longer here either. It’s our deteriorating environment, unfortunately. They are such a cool creature! My son had one as a pet years ago. I had one, too, as a pet! Fed it frozen brine shrimp (thawed some) that it ate off of my fingers. Talk about blending into the background! I have never seen a praying mantis before, so this is a first for me. Plus a nice poem to boot! They are getting more and more rare because of the deteriorating environment, unfortunately. I can’t “like” that comment because sadly it is only going to get worse. Tom, I have a favor to ask. A fellow blogger likes dinosaurs and I sent her the link I sent you about the dinosaur footprints. I told her about your dinosaur tooth post. I looked for a search feature on your blog, could not find one, so thought I would ask if you could send me the link to that post, when you get a chance of course. Thanks! Thanks Tom, that is it and I will pass it along to Heather. She is in the UK, so likely won’t see it until tomorrow. I appreciate it. Your words are beautiful. I have always been apprehensive of these creatures. I don’t know why exactly…..but their mating habits do seem to substantiate my fears. But, nonetheless, a lovely image as well. They are getting hard to find (at all) these days. Your photo’s beautifully detailed, and interesting. I heard quite a discussion last weekend about the advisability of moving these creatures if one’s found on a hummingbird feeder. Apparently they’re fearless enough to take on a hummingbird — it’s hard for me to imagine, but there’s a lot in nature I never imagined until I started looking around. 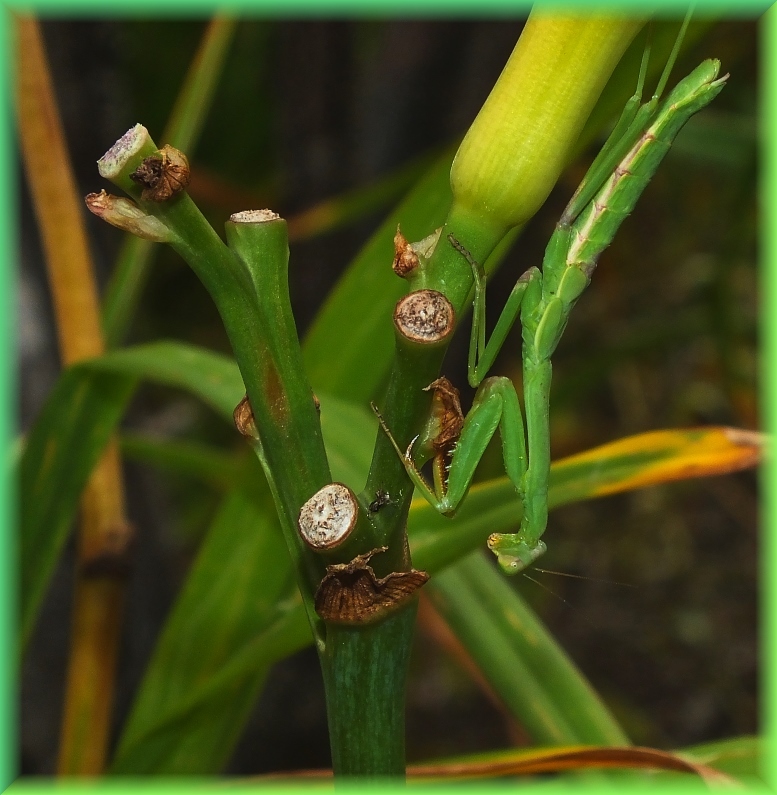 Look at this article I found tonight about mantises. It’s just fascinating — I thought you’d enjoy it, too.